This charming and comfortable garden apartment is light and airy and is fully self contained. There is a small living/dining/kitchen area and the kitchen is equipped with microwave, full gas stove, full fridge and all essential utilities. The bedroom has a double bed with plenty of shelving and space for clothes. There is a small bathroom with an open shower. There is an outdoor deck and area with table and chairs for relaxing during the day, or having a quiet drink in the evening. Included in your stay - tea and coffee (Twinings, plunger coffee, sugar and milk) as well as other staples. 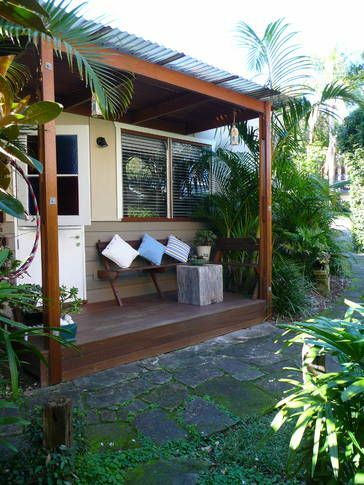 Situated near world class beaches such as Palm Beach and Whale Beach, and close to the beautiful waters of Pittwater. Avalon has a wonderful village feel, with a lively cafe culture, fantastic restaurants, an independent cinema and great shops. Within a five minute walk, there are great cafes, Mali Thai restaurant, Cranzgot's gourmet pizzas and Oliver's Pies. Angophora Reserve home of local Koala population ?? Great little place home away from home. Everything we needed was supplied. Location was convenient to Avalon beach walking distance from the cottage. Nice and quiet and very relaxing ambience. Compact, clean and cozy. Centrally located to shops. Host provided transport to our venue. Happy to recommend this cozy cottage. Great location, close to hiking trail. Compact unit, but it was all I needed. Jo was very helpful: loaned me a charger for my cell phone, and also a hairdryer. Thanks again. Very friendly and welcome owners gave just the right balance between providing useful information about the area and space for me to enjoy it! My wife and I stayed at Ripples for two nights as we had to attend a wedding at Avalon Beach. Originally we planned to just stay the night and return to our Sydney home (an hour away) the next morning, but instead decided to make a weekend away and enjoy the area. And oh what a lovely area it is. We felt like we had a food tour...the Boathouse at Palm Beach, Whale Beach kiosk, Bert's Restaurant, Jonah's (wow, the view and the food..yumm!) plus a few more locals and some further afield. The property itself is very homely, it's clean, it's comfortable and very well designed for the size. Jo kindly offered us a lift to Avalon Beach (only a 10-15min walk but it was 27 degrees and we were all dressed up for a wedding). A much appreciated gesture, as was the early checkin and late check out (neither requested but it was offered).... ALL IN ALL .... WE HIGHLY RECOMMEND and will return if we are in the area. Thanks Gavin. So glad you enjoyed your weekend.